Louis Riel is the grandson of Jean-Baptiste Lagimonière (1778-1855), a farmer and a voyageur who made a name for himself. On April 21,1806, he married Anne-Marie Gaboury (1780 – 1875), the first white woman resident in the west, and the grandmother of legendary Louis Riel. Upon learning that the Earl of Selkirk, DOUGLAS, THOMAS, Baron DAER and SHORTCLEUCH, 5th Earl of SELKIRK (1771 [St Mary’s Isle, Scotland] – 1820 [Pau, France]) was settling the Red River, Lagimonière and his wife went to live in the Red River settlement. 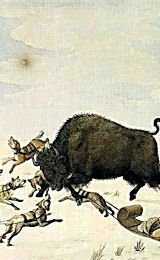 But rivalry between the Hudson’s Bay Company and the North West Company was so intense that North-West Company men nearly destroyed the settlement. Lagimonière was sent to Montreal to speak to Lord Selkirk, but taken prisoner on his way back to Manitoba. Lord Selkirk attacked the fort and the settlers were able to resume a difficult but relatively normal life. Lord Selkirk rewarded Lagimonière for his services, by giving him a large grant of land between the Red River and the Seine, close to present-day Winnipeg. Lagimonière had become a celebrity. The Lagimonières had several children: four girls and four boys and, for a time, they became a very prosperous family. One of the Lagimonière daughters, Julie, married a Métis, a neighbour named Louis Riel, and is the mother of Louis and is the mother of Louis Riel (22 October 1844 – 16 November 1885; aged 41) who is considered the father of Manitoba. An intellectually-gifted child, Louis Riel was sent to the Petit Séminaire, in Montréal, to prepare for the priesthood. He dropped out before graduation and studied law under Rodolphe Laflamme. He was not very fond of the subtleties of laws and slowly found his way back to Manitoba working odd jobs in Chicago and St Paul, Minnesota, where many of the voyageurs employed by John Jacob Astor’s American Fur Company had retired. He then travelled back to the Red River settlement, which had changed during his absence. On his arrival in St-Boniface, the current French area of Winnipeg, Riel observed that settlers had arrived from Ontario. They were white Anglo-Saxon Protestants who disliked Catholics. Many were Orangemen or Orangists. Settlers had also moved up from the United States. As well, land surveyors were dividing up the land, but not in the manner it had been divided formerly. The long strips of land of New France were becoming square lots. This land still belonged to the Hudson’s Bay Company, but the Crown was preparing for a purchase (1869) and no room was being made for the Métis. Moreover, William McDougall, an outsider, had been appointed Lieutenant-Governor of the territory and was overseeing the progress of the land surveyors. 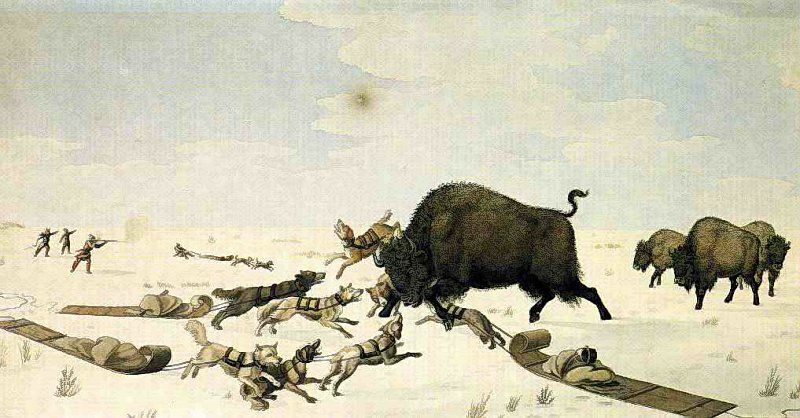 As for the Métis, they had suffered from an invasion of grasshoppers, so food was scarce. Moreover, immigrants were walking all over the Métis’ flower-beds, metaphorically speaking. They therefore needed a leader and went to Louis Riel for help. Riel quickly organizes a “national committee” to put an end to the surveyors’ work. On 2 November 1869, Riel and his men capture Fort Garry unopposed. However, John Christian Schultz and John Stoughton Dennis start to prepare for an armed conflict. The Federal Government recalls McDougall and orders are given to end the work of the surveyors. by a soldier named Charles Boulton. A good will mission arrives from the Federal Government. One member of this group is Donald A. Smith, the chief representative of the Hudson’s Bay Company. Frightened by Thomas Scott and Charles Boulton, Métis have them imprisoned and court-martialed. They are condemned to death by Ambroise Lépine. Thomas Scott, an Orangeman, is executed despite pleas on the part of Donald Smith of the Hudson’s Bay Company. The Bishop of Saint-Boniface, Bishop Taché, returns from Rome carrying and amnesty proclamation for all acts previously performed. At this point, a committee of Métis reach an agreement and the Manitoba Law is passed on 12 May 1870. The Federal Government gives land to the Métis and makes both French and English the official languages of the new Province of Manitoba. However, in 1870, after learning that Colonel Garnet Wolseley is being sent to the Red River by the new Governor General, A. G. Archibald, Riel flees to the United States but returns home to Saint-Vital in the fall of 1871. He then offers to help keep Fenians from attacking the Red River Settlement. He is re-elected to the Federal Assembly in 1874, but a motion to expel him from the room was proposed by Orangist or Orangeman Mackenzie Bowell and was passed. But Riel is re-elected into office. However, he will not sit with other members of Parliament. At about the same time, Ambroise Lépine, who condemned Thomas Scott to death, is also condemned to death for the “murder” of Thomas Scott, but his sentence is commuted. He spends two years in jail and loses all his rights. However, Lépine and Riel are amnestied, in February 1875. Next, Riel spends nearly three years (1875-1878) in hospital where he was treated for depression. He has turned to religion and feels he has a divine mission to guide his people. Riel was released from hospital and went to the United States where he managed to earn a living, became an American citizen, joined the Republican Party and, in 1880, he married a Métis woman, Marguerite Monet (1861-1886). Riel fathered three children. His wife, Marguerite, died of tuberculosis in May 1886. She lived with Louis Riel’s mother, Julie Lagimonière. He is tried and his lawyer asks that he be examined by three doctors one of whom comes to the conclusion that Riel is no longer responsible for his actions. This divided determination is not made public and Riel is condemned to death. 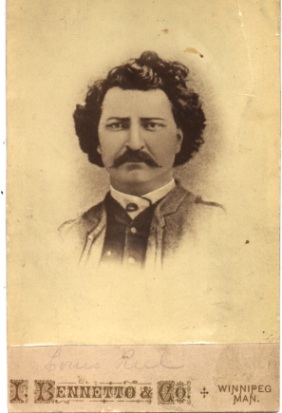 Appeals fail so Louis Riel is hanged in Regina on 16 November 1885 and the body is then sent by train to Saint-Vital and he is buried in the cemetery of the Cathedral at Saint-Boniface. To this day, opinion remains divided as to Riel’s guilt. Yet, Louis Riel had been elected into office three times. He is still considered by many as the father of Manitoba. Moreover, Riel had brought Manitoba into Canadian Confederation as a bilingual province and with Métis being allotted the land they needed. Yes, the Red River Rebellion was ‘treason,’ but clemency had been requested by the judge and there were mitigating circumstances: Riel’s mental health is one of these contingencies. However, the execution of Thomas Scott had long generated enormous resentment on the part of Ontario Orangemen or Orangists. As a result, being amnestied did not weigh in Riel’s favour. As for the North-West Rebellion of 1885, it was ‘treason.’ Riel was found guilty and condemned to death, but the judge had asked for clemency. However, Orangists remembered the execution of Thomas Scott and despite appeals Riel was hanged ostensibly for ‘treason,’ but also, in all likelihood, for the “murder” of Thomas Scott. Riel, who was hanged for ‘treason,’ is nevertheless a Father of Confederation. Thank you for the auspicious post. It actually enjoyable. A complex glance made agreeable from you! Hi to all, it’s actually a good for me to go to see this web page, it contains helpful Information. Wow! After all I got a blog from which I am capable of obtaining helpful information concerning my study and knowledge. not sure why but I think its a linking issue. I’ve tried it in two different web browsers and both show the same outcome. Excellent items from you, man. I have understand your stuff previous to and you’re just extremely great. I really like what you’ve received right here, really like what you’re saying and the way in which you say it. You are making it entertaining and you still care for to keep it smart. I cant wait to learn far more from you. That is actually a great website. I found this article very interesting. I dont know to much about Canadian history so thank you for posting it.